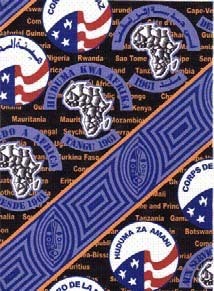 The Friends of Cameroon has designed a stunning, multilingual "pagne" (the six-yard length of African clothe) that incorporates the Peace Corps logo, the continent of Africa, and the names of all the countries where Peace Corps has ever been active in Africa. FOC is now taking orders for the cloth. This is enough cloth for one woman's outfit or 2 to 3 men's jumpers. The cloth also makes a creative table cloth, window curtain, wall decoration, and more. The cost is only $35, plus $6 shipping. The next order will ship in March/April. Place your order today by sending a check to Friends of Cameroon Pagne, 13201 Stravinsky Drive, Silver Spring, MD 20904. There is only a limited supply still available, so order today to guarantee you are not left out.